Rochester and Chatham Races, we understand, are fixed for Thursday and Friday, the 4th and 5th of September. T. Collier, Esq., of Parrock, and Colonel Griffiths, of the Cavalry Depot, Maidstone, have accepted the office of stewards. A curious return was made to the Capt. Superintendent of Chatham Dockyard on Friday of the number of workmen and others who were absent from the establishment on the afternoon of that day, from which it appeared that no less than 2,000 of the employees of the dockyard absented themselves on the afternoon in question to attend the races on the lines, a number stated to be unprecedentedly large. THE LEASE OF CHATHAM LINES. — In consequence of the Government having consented for the races to be continued yearly on the Lines, in deference to the strongly-expresssed wish of the public, notice has been given to all the parties tendering for the lease of Chatham Lines, that new tenders will be received from parties wishing to rent the same. The tenders received by the Government a few weeks since had been sent in under the conditions stated, which were that the races would be discontinued, but as the authorities have withdrawn that restriction from the new lease, it was thought that higher terms could be obtained, and hence the notice which has been given that new tenders will be received. It is positively stated that a clause will be inserted in the lease for the booths, shows, stands, &c., to be closed each evening at eight o'clock. It seems I can now expand the date range for the races at both ends of the timescale. An unfortunate accident occurred during the last race on Chatham Lines on Tuesday – four horses had started for a sweepstakes they had been round the course and were coming in at their swiftest speed towards the distance ground when a cow which had been driven into the field with most inconsiderate and culpable carelessness passed across the course unfortunately one of the horses ran against her and both came to the ground. The rider a lad from Newmarket was thrown with excessive violence over the horse’s head and was taken up senseless and carried to the hospital. It was a long time doubtful whether he would recover but we are happy to hear that he is now considered to be out of danger. The horse which sustained scarce any injury afterwards ran over a child who was in consequence dangerously wounded in the head. He is also now in a fair way of recovery. THE RACES.—The meeting this year, which is fixed for the 6th and 7th September, promises to be as attractive as that of any former season, both as regards the number of races and the character of the horses entered. There will be five races on the first day, and six on the second. 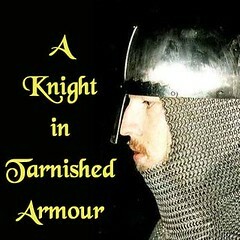 The stewards are Lord Courtney, Sir E. Filmer, Bart., M.P., Mr. Serjeant Kinglake, M.P., and Captain White. Mr. E. W. Topham the clerk of the course, Mr. Manning judge, Mr. Starling starter, and Mr. Windeyer secretary. The committee have made arrangements with Mr. Wood for the erection of the grand and other stands, which are to be so arranged that the increasing number of visitors at this meeting will find ample accommodation. 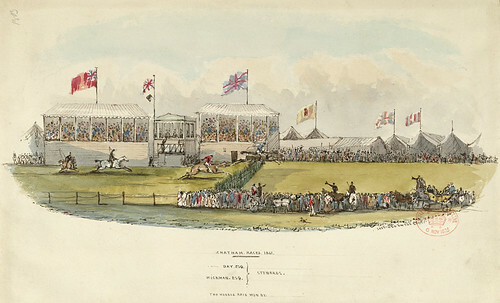 The races are held in August under the auspices of the country and borough members, on an extensive plain on the summit of the height without the lines; they continue about two days, and the scene presented to view is one of considerable animation, being numerously attended by a gay assemblage of rank and fashion of the surrounding country. During its continuance there is an almost total suspension of business; for great and small are equally attracted to the stand, and all are alike intent on the exciting nature of the sport. First: Does anyone know when these races first started being held on the lines and when they finally stopped them. The earliest date I have seen mentioned so far is 1822, and the latest 1848, but I think the races may have been going before and after these dates. Maybe they should bring them back as part of the Lines World Heritage bid! Friday the town of Chatham was thrown into the utmost confusion owing to a body of Sailors and other persons parading the town armed with bludgeons. This disturbance arose from a serious riot that took place on Chatham Lines the preceeding evening when the privates and the non-commissioned Officers belonging to the 88th Regiment advanced in complete battle array towards the booths where the people were enjoying themselves after the races. The soldiers armed with bayonets plunged them indiscriminately into every individual within their reach, thereby wounding about 30 persons. A warrant officer belonging to his Majesty's ship Tribune now lies at the Royal Naval Hospital, Brompton, in a very precarious state; and James Parr, a stome mason, recieved two severe sabre cuts in the head, which nearly proved fatal. There is a drummer lying at the hospital, and no hopes are entertained of his recovery. The scene on the Lines was terrific, men, women and children were trampled and cut about in a most horrid manner. A public meeting is to take place on the subject; a requisition has been presented to the High Constable, signed by many respectable inhabitants. The following are the words of the requisitions;- " We, the undersigned, request that you will call a public meeting of the inhabitants of the borough, to take into consideration the steps necessary to be adopted to protect themselves from the violence, and to pevent, if possible, a repedition of the outrages which have been recently committed by some of the troops at present forming a part of the Chatham Garrison, who have in several instances wounded many persons with their bayonets." Rochester and Chatham Races were held on the Chatham Lines for part of the 19th century. They took place late August, early Septmber, and like the yearly military Siege Operations held on the lines, the races were very popular. Huge crowds came to watch them, many from London, who took Steamers to Gravesend, then the rest of the journey would be made by stagecoach and later on by trains. Regulations were very strict, and unlawful Betting was strictly prohibited, but no doubt it often took place. Grandstands and booths were erected as were many stalls selling food to eat whilst there. Bands played and there was much pomp and ceremony. With the huge crowds pick-pocketing and other crimes were a risk so Metropolitan Police Officers had to be hired to keep an eye on things. Robert Pocock noted on Thursday 29th August, 1822 that a woman was killed by a horse and cart going over her at the races, and in 1848 Thomas Kenning was commited to prison for ten days as a rogue and vagabond for playing at an unlawful game of chance on the racecourse. The races continued for a number of years, but eventually they were banned because of the increasing amount of lawlessness. Rewritten in my own words from Sources: Bygone Kent, Volume 19, Number 11, and "The Gillingham Chronicles" by Ronald A. Baldwin.